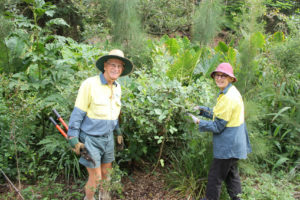 OCCA’s CreekCare Team is a roving group of volunteers that assist Habitat Brisbane groups in Oxley Creek Catchment with their regeneration sites on Thursday mornings from 7am to 9am. Some of the group then go on to assist in the Community Native Plant Nursery. Come along and enjoy the company of this hard working group of volunteers, contribute to the maintenance of some significant sites in the catchment and share in morning tea. If you are interested in being involved, contact the coordinator: Noel Standfast on 3379 8008 or 0417 703 442, or Brian McDonald on 3376 8608 or 0438 678 436.